For the past few years, Unmanned Aerial Vehicles (UAVs) – or drones, as most like to call them – have been the subject of much controversy due to their use in the fight against global terrorism. However, such debates often undermine the true potential of unmanned aerial vehicles and their application in a number of industries operating outside of the military industrial complex. Commercial and consumer drone technology has gained mainstream exposure in recent times. Many new companies have explored various possibilities wherein drones can help cut costs and increase efficiency. Recently, Amazon.com, Inc. (AMZN) unveiled plans to use drones to deliver packages directly to customers’ doorsteps within 30 minutes. The news went viral and received much attention from both media outlets and curious consumers. With Amazon bringing a non-military application for drones to the mainstream, Bidness Etc decided to explore some other spaces where drone technology is being applied. The AirDog by Helico Aerospace Industries, a self-proclaimed “airborne sidekick,” is an automated drone designed for the purpose of capturing high-quality video of extreme sports using a GoPro camera. With a foldable body and small size, the quadcopter is dexterous and easy to use. The automated system on board the drone allows anyone to take control without any experience in remote-controlled flight. Users just need to set shooting modes and let AirDog do the rest. It comes with a waterproof smart device called AirLeash, which can be worn around the subject’s wrist or attached to a helmet, surfboard, or backpack. The AirLeash communicates with the AirDog in real-time using long-range Bluetooth, transmitting your location to the quadcopter using a GPS device. The AirLeash enables one of the best features of the drone: the ability to automatically track subjects and make sure the camera is pointing in the right direction. The wearable component also alerts users when the AirDog is running low on battery. The quadcopter comes with a companion smartphone app which allows users to keep track of their activities, and also to program advanced flight paths and modes. The activity data and footage collected can be viewed and shared using the app. The AirDog is a great companion for anyone involved in action sports and looking to monitor their progress to improve their skill levels or share their adventures with friends. 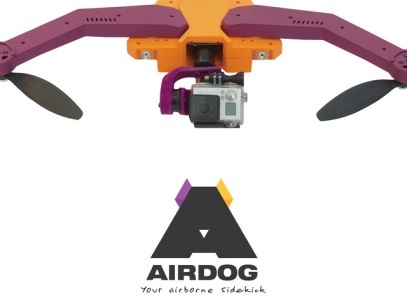 With its automatic take-off and landing mechanism, the AirDog makes sure your focus remains on your sport. Developed by DJI Innovations, Spreading Wings S800 EVO is a powerful new drone that offers professional photography and videography solutions. 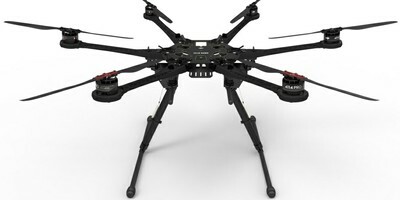 The latest UAV from DJI sports a strengthened frame and a new power system which allow a range of professional camera and recording equipment to be placed on board. The BBC has acquired the S800 EVO for its coverage of the 2014 FIFA World Cup in Brazil, and has produced some stunning footage using it. The S800’s Vibration Absorber Kit allows camera equipment to operate without picking up any vibrations from the motors or the frame, and also to operate regardless of weather conditions to capture the best quality images and video. Additionally, the drone features retractable landing gear, which allows for wider aerial perspective and flexible shooting angles. Spreading Wings S800 EVO is a great UAV for the professional videographer. It makes it possible to capture shots and angles which once required high budgets and serious production capabilities. 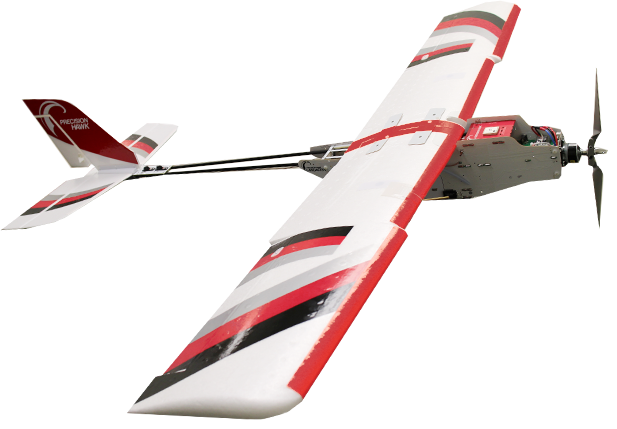 PrecisionHawk develops tools that enable buyers to efficiently collect and analyze big data. The company has developed the fully-automated PrecisionHawk UAV and data-processing platform to help farming industry professionals better analyze their crops and farmland to increase productivity and reduce costs. The drone flies over crop fields, snapping images and analyzing them using its onboard sensors to determine crop areas in need of attention – an activity that would be exceedingly time-consuming for farmers were they required to walk the fields and gather the same data. The PrecisionHawk UAV is equipped with an advanced artificial intelligence (AI) system which monitors conditions in real-time and processes the collected data for instant review and feedback. The onboard AI system makes sure the drone takes a complete assessment of its surroundings, including weather conditions, structural fatigue and battery status, in order to automatically create its own flight path. The UAV is designed to work autonomously and can take off, collect data, and return to its home-base without the need of human intervention. The PrecisionHawk drone is equipped with a number of sensors, including Visual, Multispectral, Thermal, LiDar, and Hyperspectral, which allows it to do a range of assessments ranging from plant-counting and vegetation index calculation, to plant health assessment. The system is also equipped with 3D mapping and water quality assessment technologies. PrecisionHawk allows farmers a complete end-to-end solution to manage their land, and makes sure they not only get access to all data, but also use it in the most efficient and user-friendly manner. 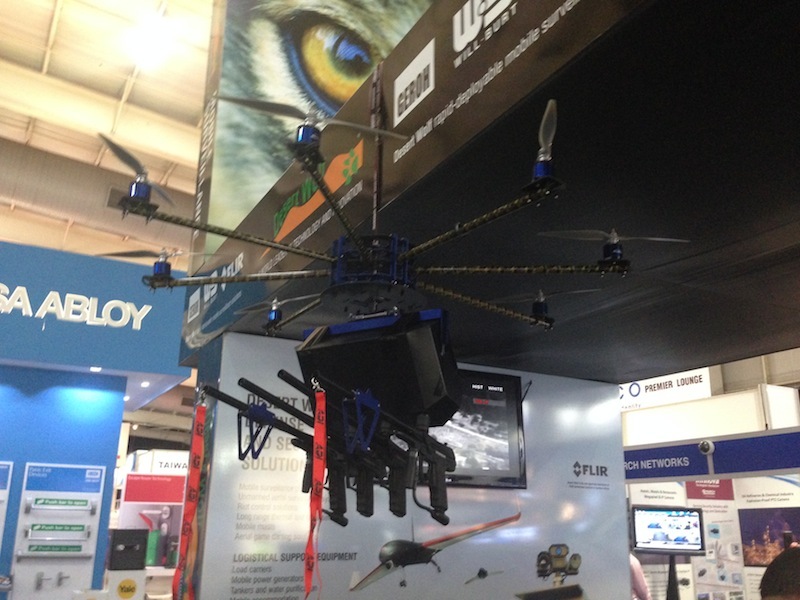 The Skunk Riot Control Copter is the latest innovation from South African company Desert Wolf. The company, which has built a reputation in developing mobile transportation and surveillance solutions, is looking to eliminate some of the dangers faced by security forces during riots with its latest UAV. The Skunk is an advanced drove which, when controlled using the Desert Wolf Pangolin ground control system, ensures transparency and accountability by putting the operating team under both audio and visual surveillance in order to safeguard against abuse of authority. The Skunk comes equipped with high-definition and thermal cameras with onboard recording and long-range control capabilities. An onboard processor and cameras enable the drone to identify and mark various targets using colored paintballs. For example, a red paintball can be used to mark armed protesters, and a blue marker can be used to identify vandals, signifying different threat levels. The powerful drone packs four high-power barrels which can be used to fire paintballs and pepper-balls to disperse the most unruly of crowds without endangering lives. In addition to its firepower, the Skunk also comes equipped with bright strobe lights and a loud speaker to direct and instruct crowds. In order to deal with varying threat levels, the Skunk also allows operators to adjust the rate of fire. Developed by Parrot, a French manufacturer specializing in wireless technologies, the Parrot AR.Drone 2.0 is their latest Wi-Fi and GPS-enabled quadcopter. The AR.Drone 2.0 is a simple-to-use UAV, controlled through the AR.Freeflight smartphone app. Its ease of use enables a wide range of consumer applications. The onboard camera records 720p high-definition video with an image stabilizer to ensure steady video footage and crisp still-image capture. The footage captured is transferred directly to the user’s mobile device for instant review. Users can use the drone’s smartphone app to toggle between front-facing and vertical cameras. The AR.Drone 2.0 includes a new Flight Recorder GPS which allows users to control the UAV using a map interface and set coordinates to determine a “home location,” which makes sure the drone to automatically returns home. The drone’s “Director Mode” gives users the flexibility to shoot beautiful, professional-looking videos by setting pre-determined flight paths and shooting angles, in addition to manually setting white balance, exposure and luminosity.